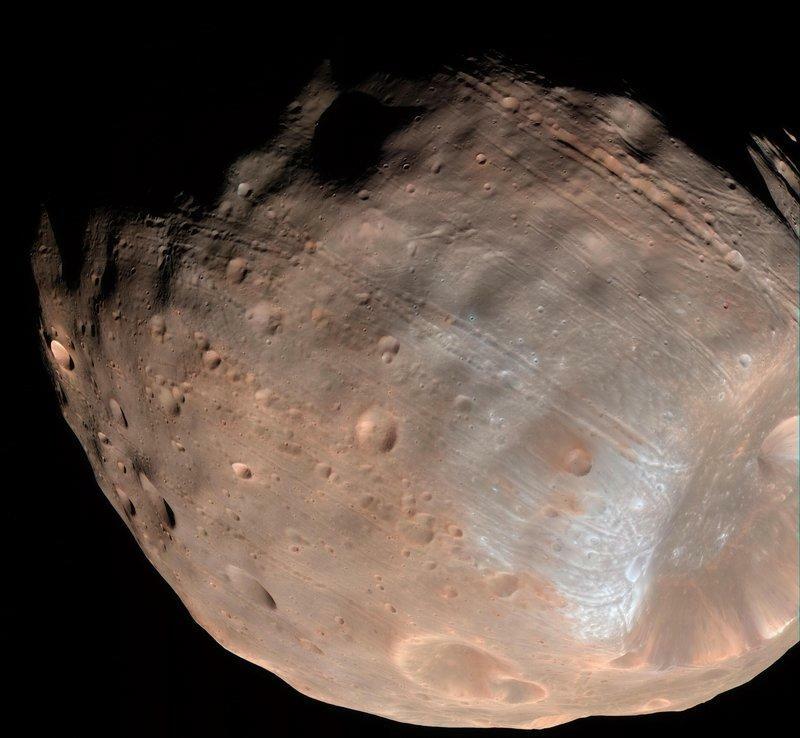 NASA says recent data indicates Mars' largest moon, Phobos, is undergoing "structural failure," and could be pulled apart within the next 50 million years. And who do you think is to blame for the demise of Phobos? An ancient alien civilization? Solar winds? "Mars' gravity is drawing in Phobos, the larger of its two moons, by about 6.6 feet (2 meters) every hundred years," according to NASA. The evidence of Phobos' demise is all over the moon's surface. As the picture above shows, Phobos is covered grooves, which are likely being produced by tidal forces; scientists originally thought the grooves were part of an impact crater, which you can see in the lower right of the picture. In addition to an unstable surface, scientists believe the interior of Phobos is nothing but a pile of rubble that's barely holding together. This rubble is apparently surrounded by a layer of powdery regolith about 330 feet thick, NASA explained. Once Phobos does break apart, Mars might one day feature a temporary ring very similar to what's surrounding Saturn. After a while, however, the debris would eventually come crashing down onto Mars' surface. If we humans do wind up inhabiting the Red Planet, that could make for a very sticky situation.